For me, the best comedy is the understated stuff. The gags that don’t shout in your face, or are designed just to elicit a wry slime rather than a belly laugh, using subtlety and a respectful nod to the reader. 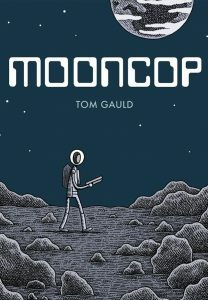 Tom Gauld’s Mooncop is built on that sort of humour, taking it’s time, building the funnies up and yet avoiding a bombastic conclusion in favour of a more melancholy and rewarding one. It’s the story of humankind’s presence on the moon, wth it’s tall buildings and all the trappings of suburbia wrapped up in air-tight bubbles. Except, this is a moon in decline, where despite the fact that we went there because we could, people are increasingly bored with the adventure amongst the regolith and are seeking the warmth and colour of Earth once more. So the titular Mooncop is not, by any means, an overworked individual, and yet he diligently executes his duties on a daily basis amongst a diminishing community. The humour is drawn via the absurdity of the situation, not least humankind’s desire to chase progress in light of the detrimental effect it may have upon us. And yet, at its heart, despite the sad truth, there remains a little warm light to lift the spirits. 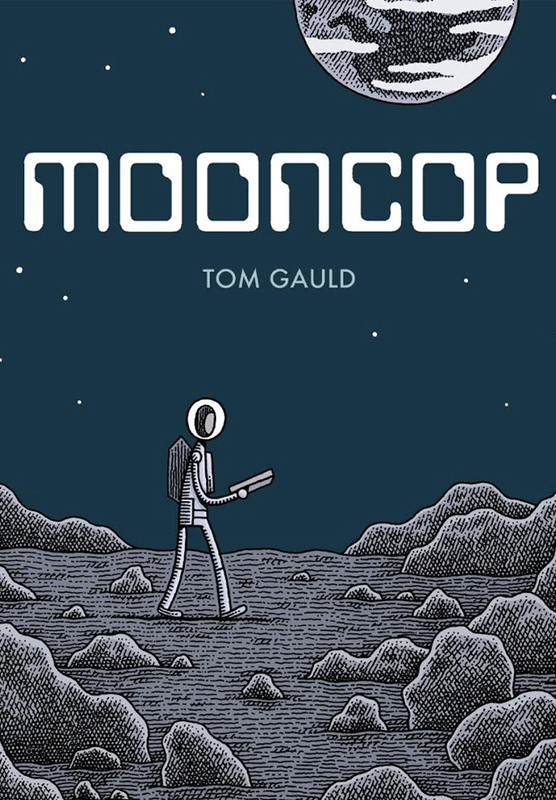 Mooncop demonstrates Tom Gauld’s gift as a humorist, evoking joy and sorrow through his cross-hatched lines. One of the cleverest and wittiest cartoonists working today, he’s forging his own path and it’s one you’ll enjoy taking a stroll down.